It’s never too late to be grateful for even the simplest, most mundane things in life! 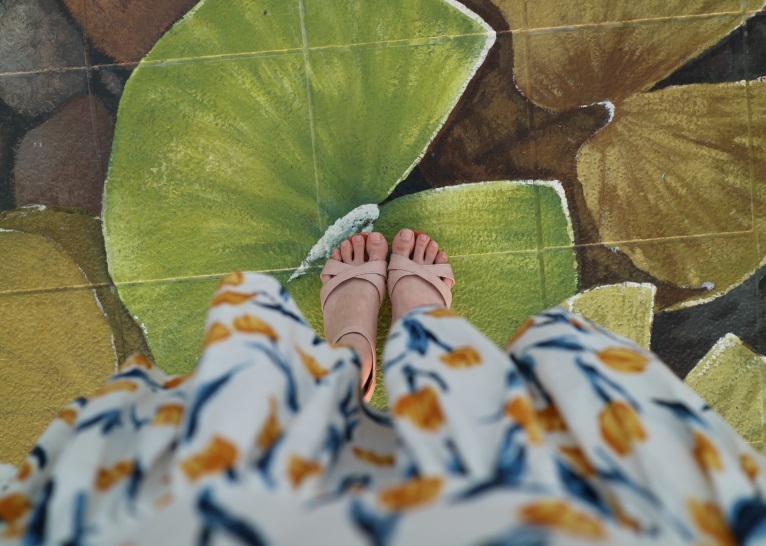 Sometimes, I get my daily inspiration from the most unlikeliest places – from a pair of black, thrifted leather sandals ;). I bought this pair of strappy sandals with a 1 ½ inch heel about a year ago. The design was really classy. It cost me only US$1.50 but one of the straps was missing, so I had to have that replaced as well. In other words, the repair cost me more than the price but the leather was so good and the design was just up my alley that I bought it anyway. But, because of being on the shelf in that dusty thrift store for some time, the leather became tough and a bit brittle. It was a pain to use because one of my pinky toes was being snuffed on the side by the leather thong that was part of the design. And so I shelved it for a time. And then, a year after I bought it, I realized it just needed a bit of leather conditioner ;). Berating myself for not thinking about that from the very start, I started conditioning the leather at least once a week or once every 2 weeks. The leather softened. Today, I suddenly had the urge to wear it and voila, the leather didn’t cut into my toes anymore! And for that, I was VERY GRATEFUL :). My message in today’s post is that sometimes, it takes a while for us to realize and be grateful for the things we have. In fact, sometimes, we get even haughty or narcissistic. We tell ourselves that we deserve this accolade or we deserve only the best because “we’re so good, we earned it, we have the right to have it, etc.”. We forget that sometimes, we got that “blessing” because of others who helped us attain it. Or we got that promotion or that new lease in life because of some “divine intervention” ;). And so I don’t want to think that way anymore. I just want to be grateful for what I have and be thankful for that. And be thankful for the people who helped me attain whatever I have right now :). So today, I’m going to write via Facebook to those I “forgot” to be grateful for and personally thank them for not just being part of my life but also enriched and blessed it 😉 ! 2017 is the Year of New Beginnings. What are you grateful for now? P.S: Apologies for “disappearing” these past few months. I do intend to be more visible and post more frequently this 2017 😉 . Happy New Year of the Rooster 🙂 ! This entry was posted in manifest a positive reality, self improvement, self-empowerment, Spirituality and tagged Being grateful, divine intervention, Gratefulness, Raising our frequency. Bookmark the permalink.